Hello, Ribbon Lovers! I was recently asked to create a special retirement card for a friend, and they wanted me to do something that really celebrates the big life changes that retirement entails. So I scratched my head for a few minutes, and decided to combine a great sentiment (Life is Better When it is Fun) with whimsical papers from Graphic 45's Steampunk Debutante collection and some beautiful Really Reasonable Ribbon. This card is so full of happy vibes and great techniques that I just had to share it with you here today. See what I mean? The sentiment on this card panel is perfect! The card panel was stitched onto burlap to add a little extra texture. 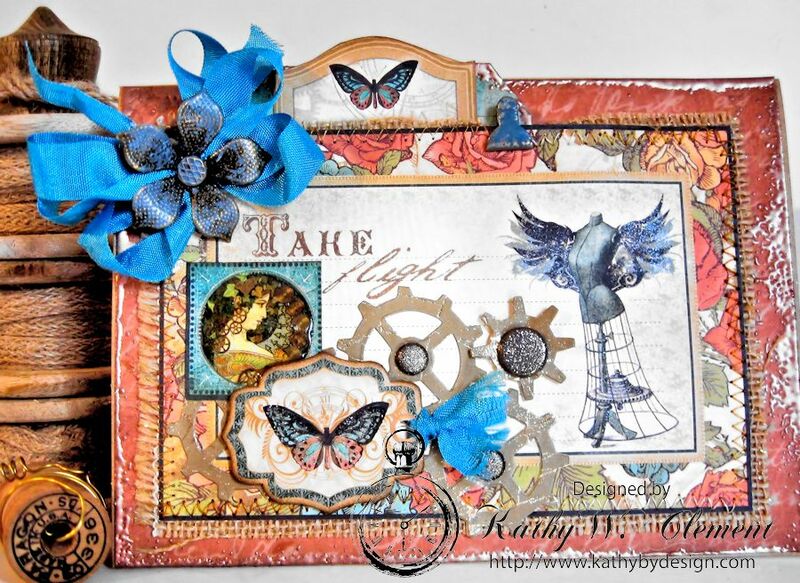 Then the edges were embossed with Metallic Copper embossing powder to add to the steampunk vibe. Layering chipboard, die cut gears, and fussy cut elements from the paper collection give the card front a feeling of adventure and happiness. I picked up on the blues in the paper collection and used my Zutter Bow-it-All to tie a soft, loopy Peacock Alley bow in the upper left hand corner of the card. Metal is always appropriate on a Steampunk Style card, so I used a metal flower from my stash and added in a teeny tiny metal clip to the assemblage. Both were tapped with Broken China Distress Paint to keep in stride with the color palette. Sentiments were stamped on the inside of the card, where more papers, gears, and images from the collection are layered up. If you are new to tying bows, or if you struggle with tying bows, seam binding is a great ribbon choice because it is soft and easy to work with. You can spritz it and crinkle it up for a shabby chic look, or tie a multi-loop bow with ease. It also comes in a whole rainbow of colors in the Really Reasonable Ribbon online store. 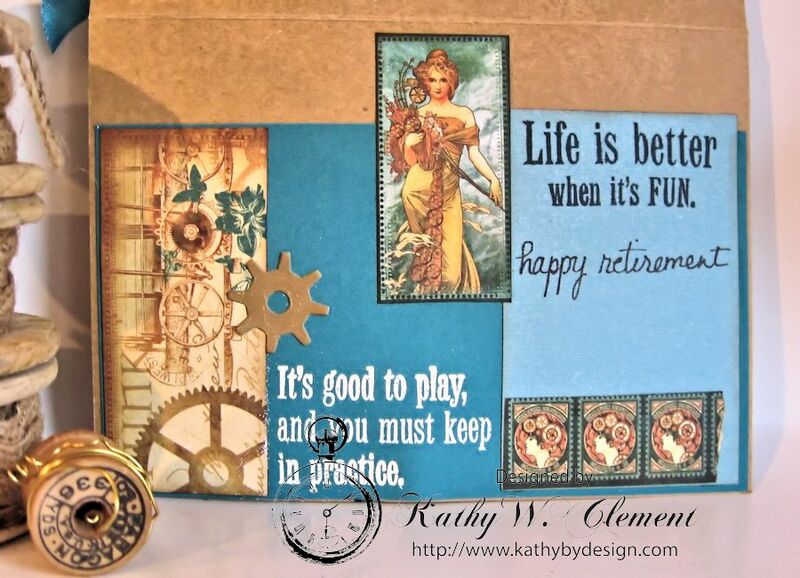 Perfect sentiments to go with a retirement card. Love the blues and Graphic 45 paper that you used. The inside of the card was as gorgeous as the outside.